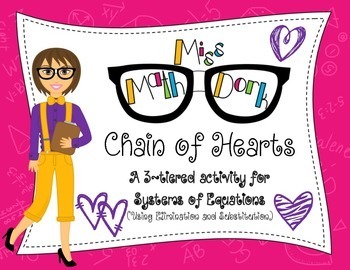 This bundle includes a 3-tiered activity with a Valentine "craft" embedded. Use the answer sheet for accountability or to assess what the students know. 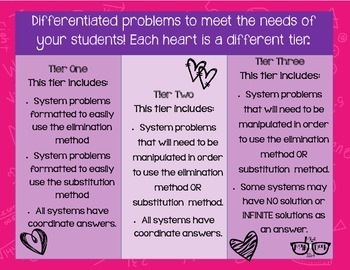 Tier 1 includes: System problems formatted to easily use the elimination OR substitution methods. All systems have coordinate answers. Tier 2 includes: System problems that will need to be manipulated in order to use the elimination method OR substitution method. All systems have coordinate answers. Tier 3 includes: System problems that will need to be manipulated in order to use the elimination method OR substitution method. Some systems may have NO solution or INFINITE solutions as an answer. There are 14 problems for each Tier. This activity is ideal for stations, independent or partner practice, or formative assessment. 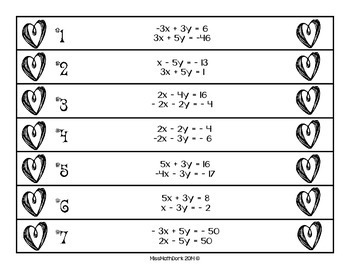 On the answer sheet students should write the heart number, show their work, and give their answer.